We’re in the process of running some user-testing for CommuniKate and AzuleJoe. User testing is an interesting proposition for the sort of things that we are building given the extreme ranges of situations that people in AAC deal with. User-testing is that thing that designers don’t want to do because they know their design will work. And user-testing just wastes time. The world is littered with the bones of people who have that view. We’re using our user-testing as a chance to get to proper grips with where some of our users are, with the issues that they want to talk about (often different from the ones that affect them), and with the stories that they want to tell. Time allowing, we’ll talk properly about the user-testing itself in a later post, today I’d like to show off our information sheet for the study. Kate made it, and it is a work of art in its own right. 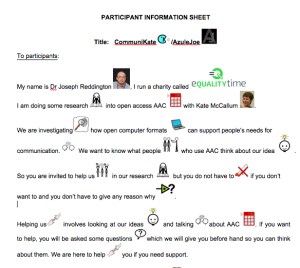 We want to make sure that our information sheet is a real one, and it genuinely gives of all the information it possibly could do for users with cognitive issues. Of course, aspects like data retention and anonymity are difficult to pull off. Kate and I went back and forth quite a bit on a suitable symbol for ‘anonymity’ (more on that in a future post). This is the first draft of our information sheet. You can view the full on in Word and Pdf, we’d be interested in any comments people might have. New release for Open Voice Factory!